Clinton slams the “phantom epidemic of voter fraud” and proposes reforms that would make it eaiser for millions to vote. Hillary Clinton delivers a speech at Texas Southern University in Houston on June 4, 2015 (AP Photo/Pat Sullivan). Hillary Clinton was a senior in high school when she watched on a black-and-white television as President Lyndon Johnson signed the Voting Rights Act. Fifty years later, the VRA—the country’s most important civil-rights law—has been gutted by the Supreme Court and voting rights are under attack across the country. From 2011 to 2015, 395 new voting restrictions have been introduced in 49 states, according to the Brennan Center for Justice, and 21 states have adopted new laws making it harder to vote, 14 of which will be in effect for the first presidential cycle in 2016. 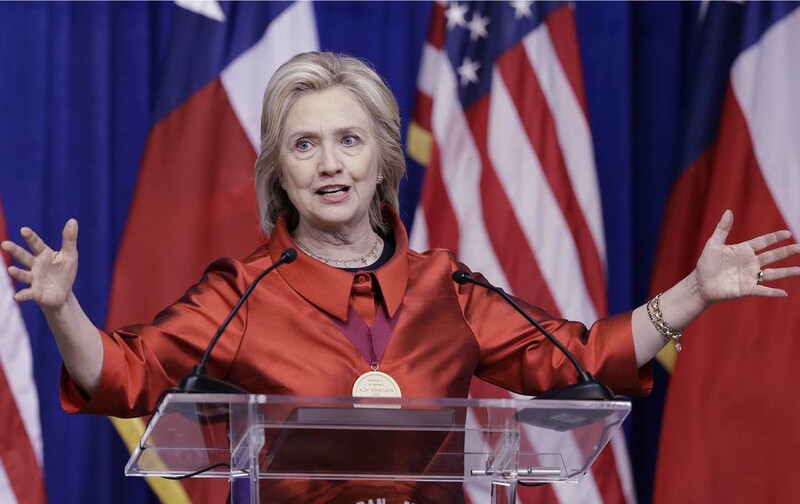 Clinton sounded the alarm about the widespread push to roll back voting rights during a high-profile speech in Texas today and offered innovative solutions to fix our broken political system. Up to a third of Americans are not registered to vote. Clinton proposed fixing that problem by automatically registering every American when they turn 18 unless they opt out. Universal, automatic voter registration—recently adopted by states like Oregon—would add 50 million Americans to the voting rolls. “I think this would have a profound impact on our elections and our democracy,” Clinton said. Fourteen states have no form of early voting before Election Day, and many others have limited days and hours. Clinton proposed a minimum of 20 days of early voting nationwide, with expanded hours on nights and weekends. “Early, in-person voting will reduce those long lines and give more citizens the chance to participate, especially those who have work or family obligations that make it difficult to get to the polls on Election Day,” she said. Unfortunately, many states continue to move in the opposite direction. Republicans have killed bills to expand early voting in fifteen states so far this year, according to Carolyn Fiddler of the Democratic Legislative Campaign Committee. Nine of 15 states that previously had to submit their voting changes with the federal government before the Supreme Court gutted the VRA have passed new voting restrictions since 2010. The Supreme Court’s decision has had a devastating impact in states like Texas, whose strict voter-ID law was previously blocked under the VRA but is now in effect, leading to many longtime voters being turned away from the polls. “We need a Supreme Court who cares more about the right to vote of a person than the right to buy an election of a corporation,” Clinton said. Efforts to restore the VRA have gone nowhere in Congress, even after 100 lawmakers traveled to Selma to observe the 50th anniversary of Bloody Sunday. These policy proposals would make it easier for millions of Americans to cast a ballot and participate in the political process. Clinton’s speech signaled that voting rights will be a major issue in the 2016 race. Lawyers affiliated with her campaign have already filed suit against restrictive voting laws in Ohio and Wisconsin and have hinted that more lawsuits are to come. It’s unfortunate that voting rights has become such a partisan issue. For many years both Republicans and Democrats overwhelmingly supported the VRA. Only recently, particularly after the election of Barack Obama, has the issue become so politicized, with GOP lawmakers passing new laws curtailing access to the ballot. Many in the media will no doubt report that Hillary’s policy proposals are intended to boost her campaign and core Democratic constituencies. Regardless of the motive, expanding voting rights is good for everybody. There’s no equivalence between policies that make it easier to vote and policies that make it harder to vote.